We're recruiting. Please get in touch! 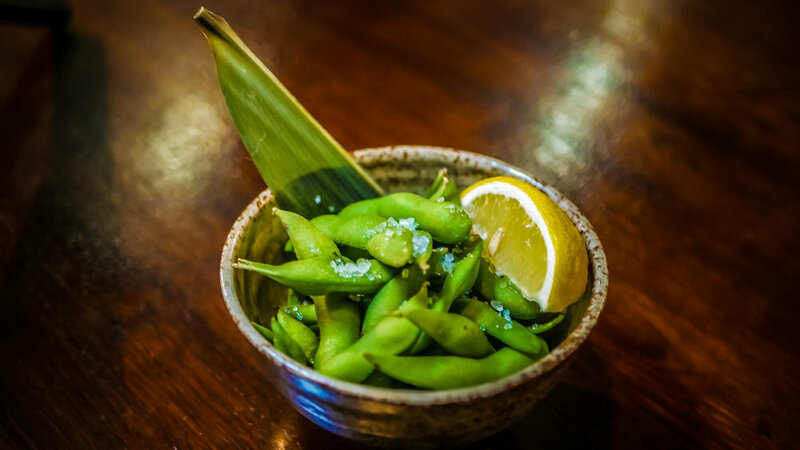 Boiled Soy Beans, lightly salted and perfectly complementing Beers and Wine. Boiled Soy Beans, Stir Fried in homemade Spicy Sauce. Tofu, Wakame and Spring Onion. Fresh Crunchy Seaweed Salad & Sesame Dressing. Baby Spinach with Sesame Dressing. Deep-Fried Chicken Dumplings with Soy and Vinegar Sauce. Deep-Fried Vegetable Dumplings with Soy and Vinegar Sauce. Skewed Chargrilled Chicken, marinated in Yakitori Sauce. 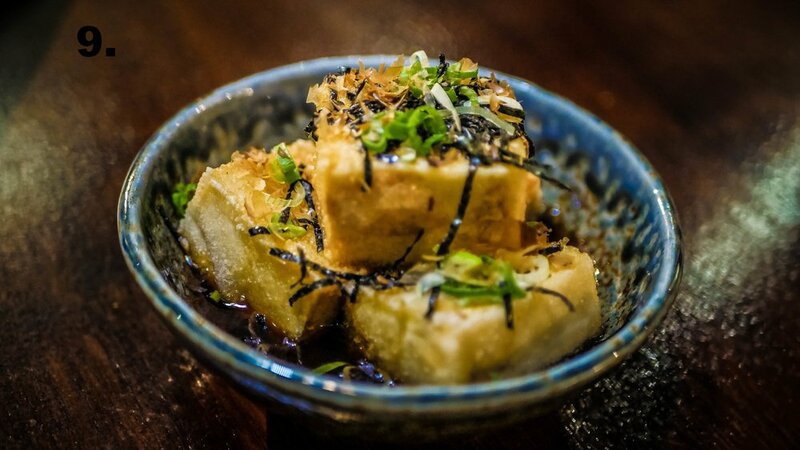 Deep-fried tofu with sweet soy sauce. Deep Fried Mashed Pumpkin coated with Grated Breadcrumbs, crispy and smooth served with Mayo and Fruity Sauce. Deep Fried Squid Marinated with Fresh Chilli & Garlic, sprinkled with Seven Spicy Powder, served with Homemade Wasabi Mayo Sauce. Deep Fried Chicken stir fried in sweet & tangy spicy sauce. Deep Fried Chicken, sprinkled with Asian Five Spices. Deep Fried Chicken Wings with Homemade Mayo Sauce. Deep Fried King Prawn coated with Grated Breadcrumbs, crispy & smooth served with Mayo & Fruity Sauce. 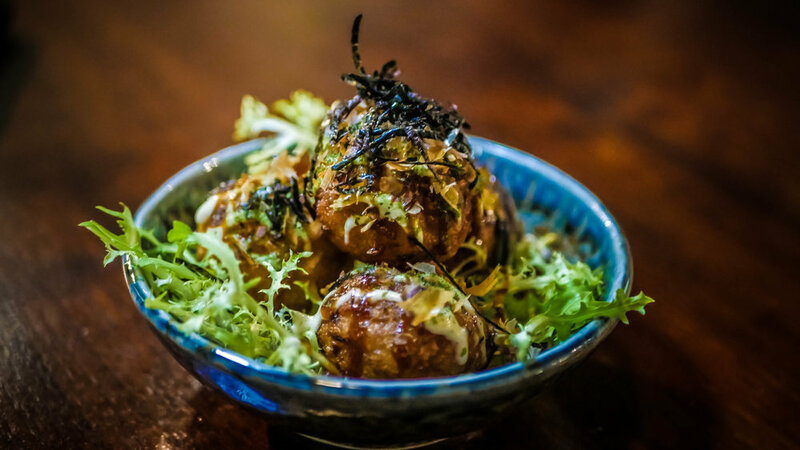 Deep Fried Battered Octopus Balls garnished with Fruity Mayonnaise, Seaweed Powder & Bonito Flakes. Grilled Chicken in Teriyaki Sauce with Mixed Vegetables. 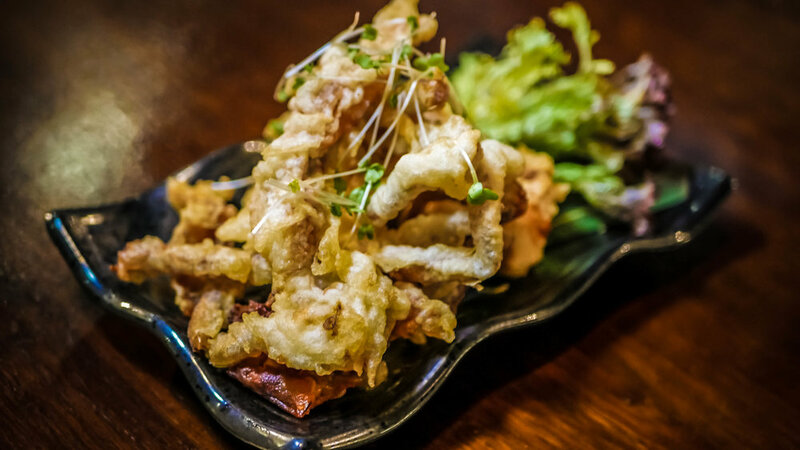 Deep Fried Soft Shell Crab in a Light Batter, served with a Dashi-Based Dipping Sauce. 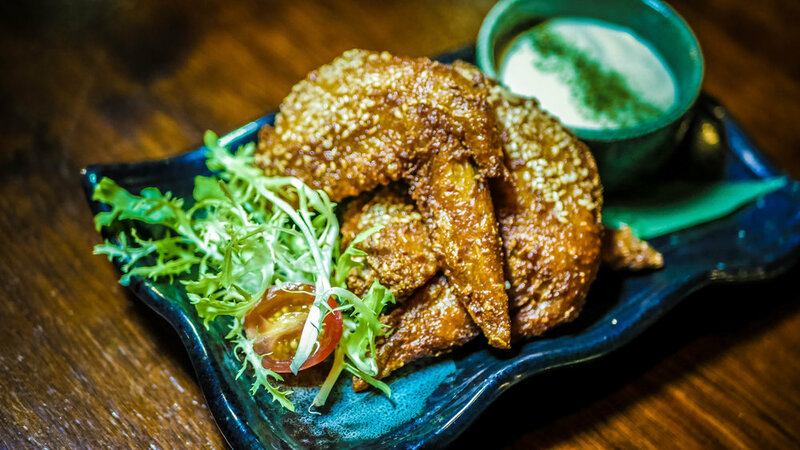 Deep Fried King Prawns in a Light Batter, served with a Dashi-Based Dipping Sauce. 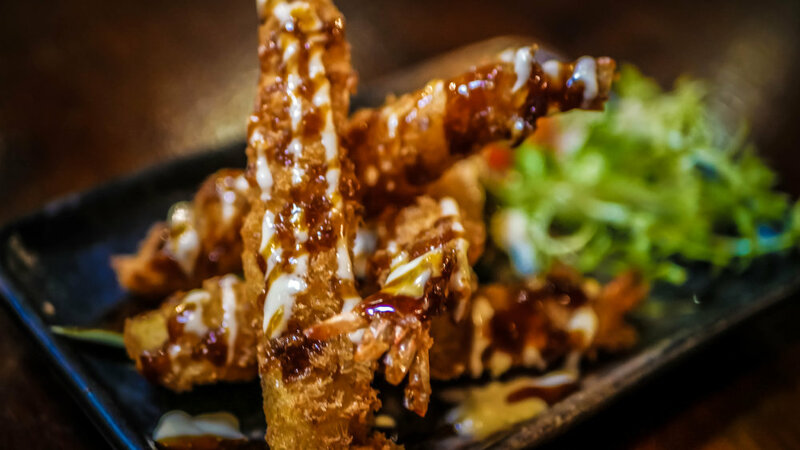 Deep Fried Selection of Seasonal Vegetable in a Light Batter, served with a Dashi-Based Dipping Sauce. 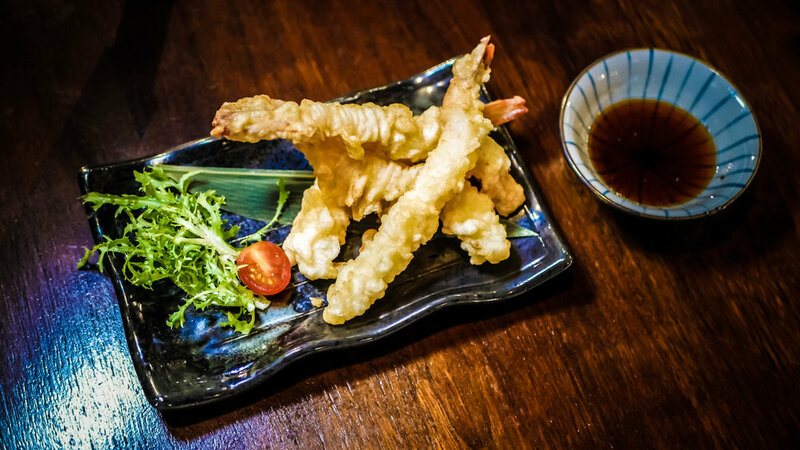 Deep Fried King Prawns & Vegetables in a Light Batter, served with a Dashi-Based Dipping Sauce. 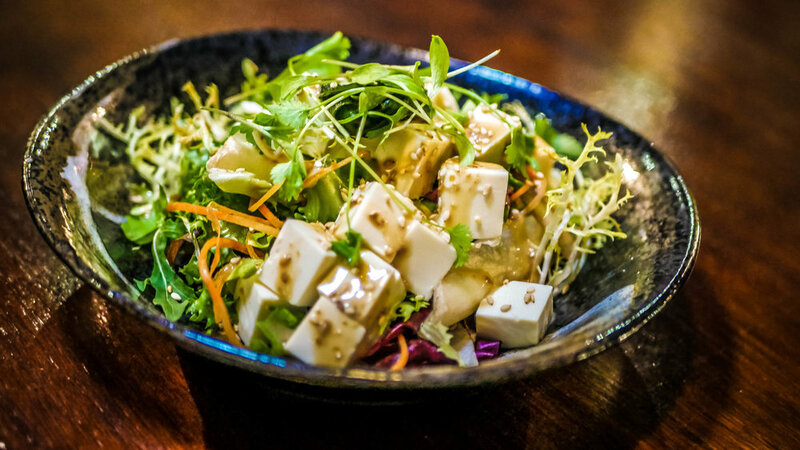 Mixed Green Leaves, Cucumber, Carrots, Tomatoes, Wakame & Tofu, served with Japanese Sesame Dressing. Mixed Green Leaves, Avocado, Cucumber, Carrots, Tomatoes & Wakame served with Japanese Sesame Dressing. Mixed Green Leaves, Katsu Chicken, Cucumber, Carrots & Tomatoes, served with Japanese Sesame Dressing. Deep Fried Soft Shell Crab with Mixed Green Leaves, Cucumber, Carrots, Tomatoes, served with Spicy Mayo Dressing. Finger shaped rice topped with various topping. Two pieces per serving. 6 Slices of seared Sirloin Steak with daikon shreds, onion and Chef Homemade Citrus Tataki sauce, garnished with Chives and sesame seeds. 6 Slices of Salmon with daikon shreds, onion and Chef Homemade Citrus Tataki sauce, garnished with Chives and sesame seeds. 6 Slices of Tuna with daikon shreds, onion and Chef Homemade Citrus Tataki sauce, garnished with Chives and sesame seeds. Small Seaweed Roll filled with Rice & Fish or Vegetables. 6 pcs per serving. Inside-Out Rice & Seaweed Rolls with a Variety of Fillings & Tasty Sauce. 8 pcs per serving. 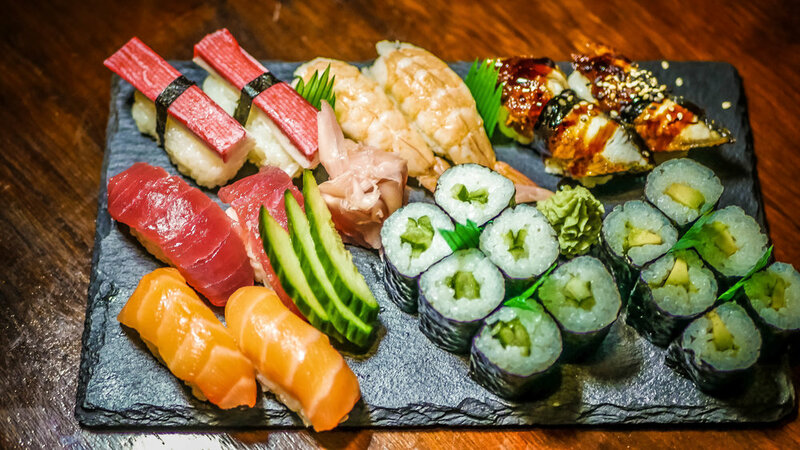 Avocado, Cucumber & Crabstick, wrapped with Salmon, Tuna, Cooked Prawn Octopus & Avocado topped with coloured Tobiko. Prawn Katsu & Cucumber wrapped with Avocado, dressed with Red Tobiko & Mayonnaise. Avocado, Cucumber & Crabstick, wrapped with Eel, Avocado & Dressed with Eel Sauce, sesame seeds & Red Tobiko. Cucumber, Avocado, Crabstick & Tamago wrapped with sesame seeds & Red Tobiko. Salmon & Avocado, garnished with sesame seeds. Spicy Tuna, Cucumber wrapped with White sesame & Spicy Sauce. Avocado, Cucumber, Yellow Pickle & Lettuce wrapped with Seaweed Powder. Asparagus, Carrot, Avocado & Yellow Pickle wrapped with White Sesame Seeds & Sesame Sauce. Chicken Katsu, Avocado, Lettuce wrapped with Sesame Seeds, breadcrumbs & Mayonnaise Sauce. Deep Fried Soft Shell Crab, Avocado, Lettuce, Asparagus, wrapped with Yukari Mishima & Spicy Mayonnaise sauce topped with Black Tobiko. 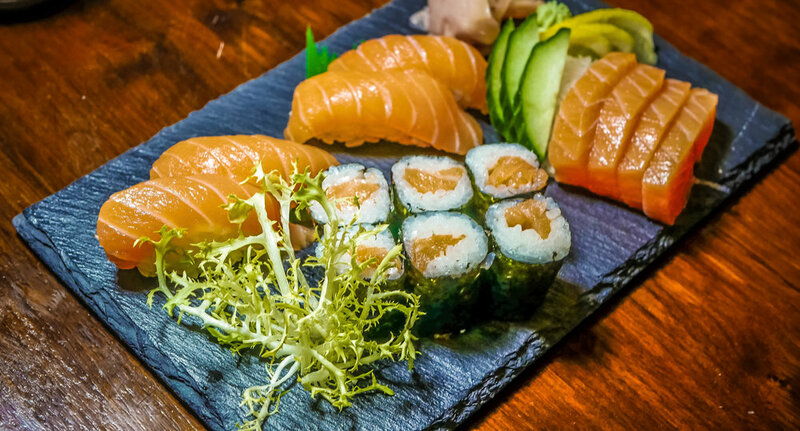 Deep Fried Tempura Prawn, Tempura Asparagus, Cheese, Avocado, wrapped with Salmon, Homemade Tataki sauce & sesame seeds. 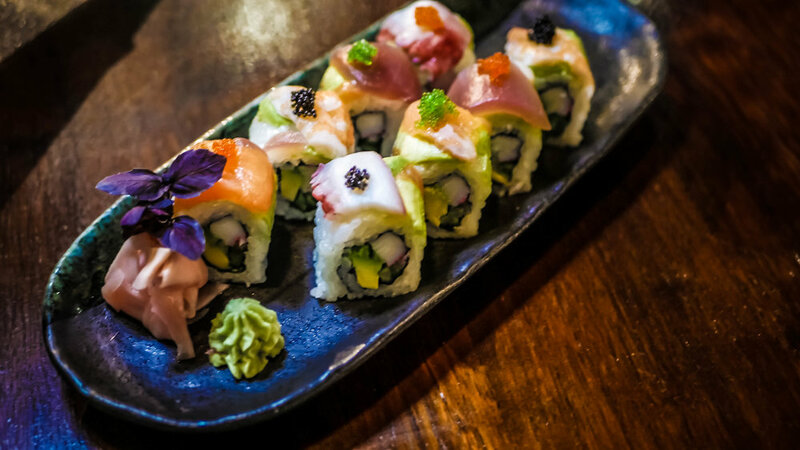 Tempura Asparagus, Carrot, Avocado, Tamago, wrapped with Sirloin Steak dressed with Tataki sauce & sesame seeds. Tempura Prawn, Cheese, Avocado, Cucumber, wrapped breadcrumbs, Red Tobiko, Mayonnaise & Unagi Sauce. Crabstick, Cucumber, Avocado, wrapped with Prawn Katsu, Spicy Mayo Sauce. Cone-Shaped Hand Rolls stuffed with Rice & Various Choice of Fillings - 1 pc per serving. With Avocado & Eel Sauce. Cooked Prawn, Avocado, Cucumber & Tamago with Tobiko & Mayo Sauce. Yellow Pickles, Tamago, Cucumber, Avocado & Lettuce with Mayo Sauce. Stir Fried Japanese Thin Noodle with Mixed Vegetables, garnished with Red Ginger Pickles. Stir Fried Japanese Thick White Wheat Flour Noodles with Mixed Vegetables, garnished with Red Ginger Pickles. Ramen Noodles in a Shoyu-Based Soy Soup topped with Grilled Chicken Slices, Boiled Egg, Naruto, Wakame, Menma, Beansprouts & Spring Onion. Ramen Noodles in a Tonkotsu Soup topped with Grilled Pork, Boiled Egg, Naruto, Wakame, Menma, Beansprouts & Spring Onion. Thick Wheat Noodles in a Spicy Kimchi Broth with Prawns, Salmon, Squid, Naruto & vegetables. Thick Wheat Noodles in a Shoyu-Based Soy Soup topped with Tempura Vegetables. 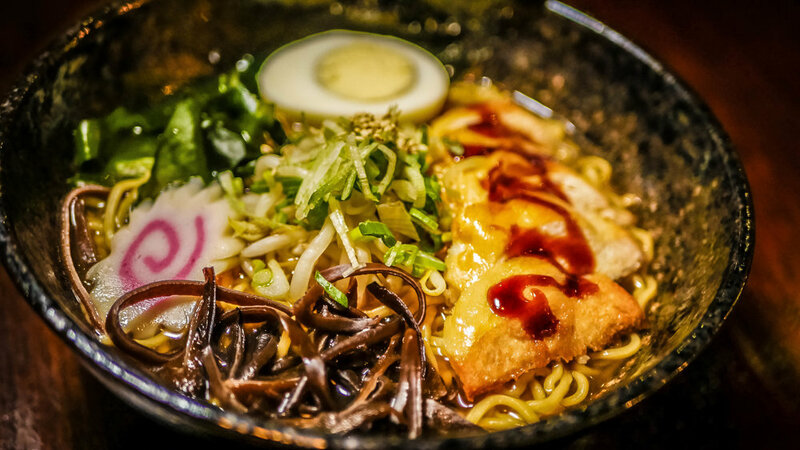 Ramen Noodles in a Spicy Soup topped with Beef Steak, Boiled Egg, Naruto, Wakame, Menma, Beansprouts & Spring Onion. Deep Fried Chicken in Panko Breadcrumbs with Japanese Curry Sauce, served with Salad & Steamed Rice. Deep Fried King Prawns in Panko Breadcrumbs with Japanese Curry Sauce, served with Salad & Steamed Rice. Deep Fried Pumpkin in Panko Breadcrumbs with Japanese Curry Sauce, served with Salad & Steamed Rice. Grilled Eel on top of Rice, served with Salad & Eel Sauce. Thin Cut Beef & Onions cook with Sweet Soy Sauce & Poached Egg, served with Steamed Rice. Deep Fried Chicken Katsu cooked with Egg, Onions & Sweet Soy Sauce, served with Steamed Rice. All BBQ Meat Dishes are served with Lettuce Wraps & Ssamjang Chilli Paste. Thinly Sliced Beef, Spicy Pork, Spicy Chicken marinated in a blend of Ginger, Korean Dark Soy & Garlic. 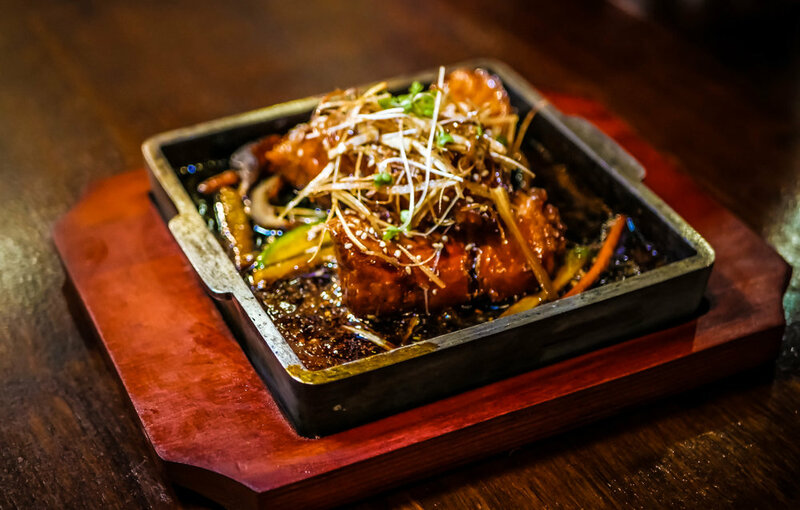 A Choice of Marinated Beef, Pork, Chicken or Eel, served sizzling hot in a stone pot, consisting of a hearty mixture of Rice, Vegetables & Sunny Side Up Egg, served with Red Chilli Paste called Gochujang.